Around one thousand devotees, farmers and activists marched from Vrindavan to Delhi to protest against pollution of the Yamuna. Called “Yamuna Muktikaran Abhiyan”, the march was conducted under the leadership of Shri Ramesh Baba Ji Maharaj of Maan Mandir, Barsana in Mathura district. It ended in Delhi on March 22 on World Water Day. Protestors demanded a clean ecological flow between Yamunotri and Allahabad and wanted sewage to be stopped from entering the river. The 1,376-km long Yamuna rises from the Yamunotri glacier (Saptrishi Kund), flows for about 120 km through hills and valleys and ultimately enters the Indo-Gangetic plain at Dak Patthar in Uttarakhand. Here, the water is diverted for irrigation and power generation. After flowing through Himachal Pradesh, the river water is again diverted at Hathnikund barrage in Haryana for irrigation. In the dry period, there is almost no water downstream of this barrage. The river here is fed by groundwater and small tributaries of the Yamuna. There is no flow observed in the dry season and the river flows very sluggishly as it enters Palla in Delhi, according to the Central Pollution Control Board (CPCB), the monitoring agency for the river. Whatever flows into Delhi is completely extracted for water supply and during the lean period, it is only sewage that flows down from Delhi. Maan Mandir wants to highlight the poor state of the Yamuna at Vrindavan, says the statement published by the organisation. 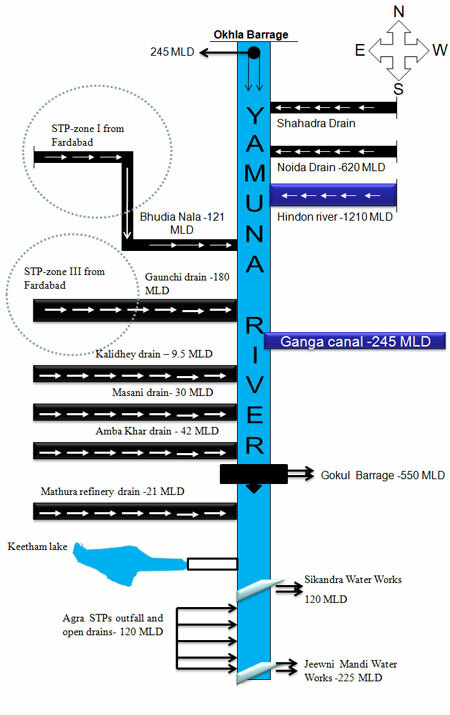 The recent CPCB 2013 shows that 22 natural drains of Delhi add about 319 tonnes/day of Biological Oxygen Demand (BOD) load to the Yamuna. Since the river has no flow downstream of Delhi (after Okhla barrage), it has lost its cleansing power. Hence, the river is unable to tackle the load poured into it from Delhi. 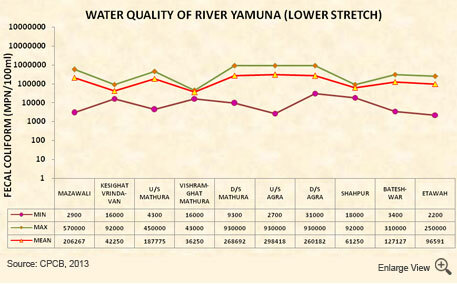 Drains from Mathura and Vrindavan, the twin religious cities in Uttar Pradesh, add to the pollution load of the Yamuna. The Kalidhey, Masani and Amba kher drains contribute pollution loads before water is extracted at Gokul barage for water supply. Around 116 tonnes/day of load is added through drains (see figure 1). 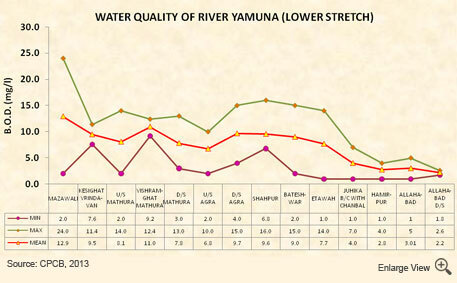 Thus, the Yamuna at Vrindavan and Mathura is completely polluted and is not fit even for outdoor bathing (see figure 2). 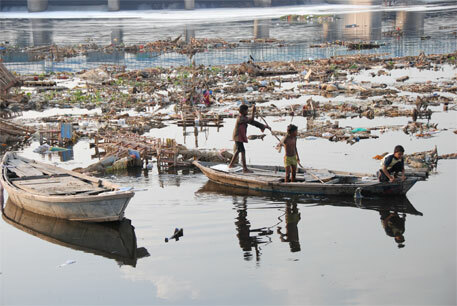 The Yamuna needs to breathe, says Manoj Mishra of Delhi-based non-profit Yamuna Jiye Abhiyan. Maan Mandir says their protest will strengthen the Central government’s initiative of cleaning the Ganga and its tributaries. River campaigners say there has been no major implementation of river cleaning plans yet.